by Neil J Feldman, DPM. As we learned last month, foot pain doesn’t just start in the feet- it’s all about the hips! Neil Feldman, DPM explains how pelvic dysfunction can lead to foot pain, and how establishing proper posture can lead to better movement. Creating a significant base of fitness is crucial to any training program. Without that base, we fatigue quicker and fall into bad movement habits quicker, increasing the risks of these injuries. Starting with good posture, run relaxed, lift the legs and lean slightly forward with the lean coming from the ankles (see Figures 1 and 2). Keep the hips stable and land more towards the ball of the foot, with every foot strike occurring underneath the body. Sounds simple, right? Reading articles like this, reading books, listening to coaches, friends and doctors can be confusing. Everybody seems to have an opinion and/or a solution. We are all unique individuals who bring different body types, with different strengths, weaknesses, levels of dysfunction, to the table. There is no cookie cutter approach to figuring things out and as such, it would be impossible to say what specific needs each of you reading this article would require. What’s presented here is the goal all runners should try to reach, but it may take time to get there. Be patient, and work with what your body allows. Figure 1: Maintaining posture at foot strike. The yellow line indicates where alignment should be: ankle, hip, shoulder and ear. The image shows that the upper body is slightly forward of the posture line and thus there is too much bending from the hips. The blue arrow indicates where the elbow should be at foot strike, with an arm angle close to 90 degrees which is ideal. Also, the wrist is above the waist which is also positive. The red arrow indicates the how the stride extends behind the runner, as opposed to out in front. Figure 2: At lift off, posture is maintained (head should be slightly forward an in line with the yellow line passing through the ankle, hip and shoulder), the bend comes from the right ankle (not marked here) and the left knee (red arrow) is driving up while the left foot remains neutral or relaxed. (Gait analysis photos provided through Central Massachusetts Podiatry, PC utilizing Dartfish professional software). Article reprinted with permission from Neil J Feldman, DPM. For more information, visit Dr. Feldman online at http://www.drfeldman.blogspot.com. Neil Feldman, DPM is the owner of Central Massachusetts Podiatry, a 3 physician practice located in Worcester, MA. 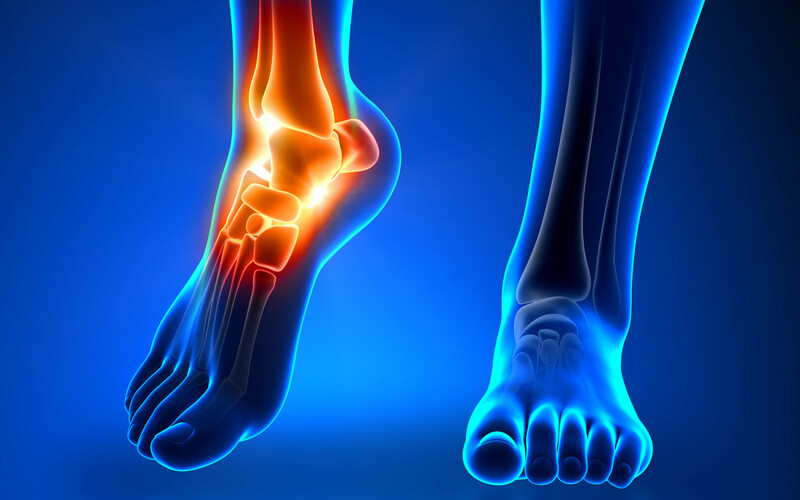 Dr. Feldman is Board certified in foot surgery and a Fellow of the American College of Foot and Ankle Surgeons. He has completed numerous Marathons and 7 Ironman triathlons including the Ironman world championship in Kona twice. Last year Neil completed the Vermont 100 mile run in 21 hours, 34 minutes. More information about Dr. Feldman’s practice can be found at http://www.worcesterfootcare.com.